GWINN — Students at Gwinn Area Community Schools will have a new teacher twice a week for the next several weeks. Forsyth Township Police Officer Sgt. 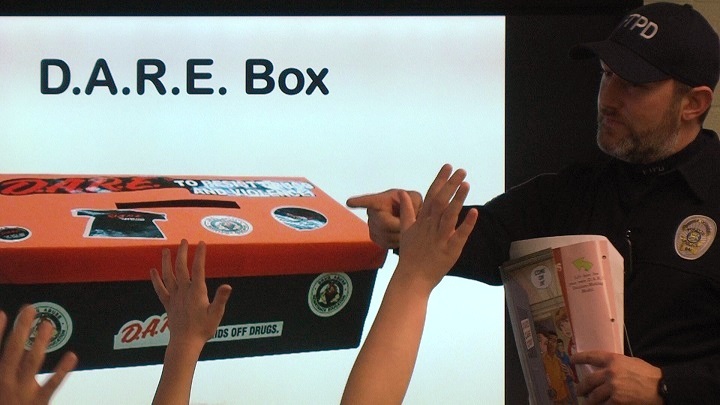 Jesse Cadwell will be teaching a ten week D.A.R.E. program to fourth graders in the district. The program disappeared from the area over the past decade, but it was brought back by the district and the Forsyth Township Police Department last summer in light of the nationwide drug addiction trend. It’s not the same program you may remember, though — D.A.R.E. America and the University of Michigan restructured the curriculum to teach the students about more than not to do drugs. “We’re going to give the kids a skill set that they can use to make a lot of choices in life. They’re going to learn a skill set that helps them resist drugs, a skill set that helps them resists alcohol or tobacco and other decisions that could affect them adversely as they grow up,” said Forsyth Township Police Chief Gordie Warchock. Additional lessons for middle and high school students and kindergartners will be taught in semesters to come. The program is funded by Gwinn Area Community Schools and the Forsyth Township Police Department, and it will endure continued costs. Donations are currently being accepted by the district and the police department in the care of D.A.R.E. to keep the program running.